History of Thrones is our series where we examine important historical events and people from the complex and controversial past of Westeros, ones that might tell us something about the story going forward on Game of Thrones. However be warned, you might not want to pass this wall of protection if you consider theories spoilers. The White Walkers didn't have to worry about getting past the Wall when they marched on Westeros during the First Long Night. The Realm's largest and most important line of defense was only built after the First Men and the Children of the Forest pushed them back to the Lands of Always Winter after the original Great War. The legendary Northern hero Bran the Builder erected the Seven Kingdoms' greatest line of defense because he didn't want mankind to ever be caught off-guard when the blue-eyed demons came south again. But even he could not have prepared for a dead dragon. Until now, the original purpose for the Wall was lost over millennia, the White Walkers becoming a tale told to scare children into behaving. The Night's Watch continued to man it to this day, but their primary function became keeping the wildlings from passing it, not the army of the dead. But just because mankind forgot why it was built, the Wall never did, because its protections go far beyond being a massive physical barrier. It wasn't only built with ice, earth, and steel; inside the Wall are charms and spells, a magic that prevented the dead from passing through. But while the Wall is mighty and magical, standing tall for thousands of years as the greatest line of defense for the realms of men, in spite of those who scoffed at its true purpose, it could not stand up to the flame of a dragon led by the Night King. But that doesn't mean it doesn't have a few tricks left up its sleeve. The First Men came to Westeros 12,000 years before Game of Thrones, and for two thousand years they fought with the Children of the Forest. While the First Men outnumbered the Children, they might have been swayed to reach a peace treaty after seeing an awesome, terrifying display of magic from the Children. The Pact was signed on the Isle of Faces by the First Men and the Children, ending both their long war and the Dawn Age, marking the start of the Age of Heroes. For two to four thousand years the two races lived in peace and friendship, until the White Walkers arrived with the cold. They pushed mankind and the Children further and further south, and darkness reigned for a generation. 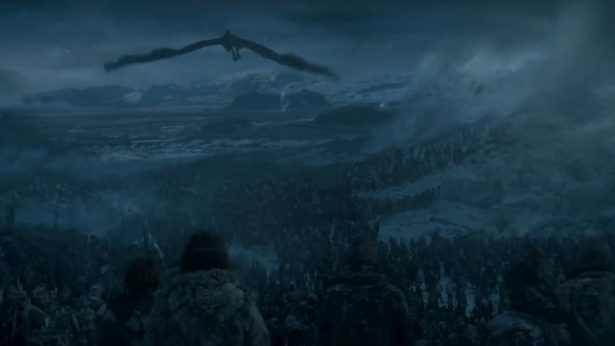 Finally, with weapons of dragonglass and led by the great hero Azor Ahai and his sword lightbringer, the First Men, the Children of the Forest, and the Night's Watch pushed the White Walkers back to their icy home far north after their final victory at the Battle for the Dawn. But the White Walkers had not been eradicated, they had retreated. So Brandon the Builder, a legendary figure who is said to have built Winterfell, Storm's End, and the Hightower of Oldtown, decided that the living must be ready when the dead came again. So they built a wall, 700-feet tall (as high as 900 feet at some points), and 300 miles wide, made of steel, earth, and mostly ice. Depending on the day or season it could look gray or blue, and is so wide at the top they say 12 men on horseback can ride side-by-side, but it is even wider at the base. From Castle Black to Eastwatch-by-the-Sea it is straight, but it is serpentine in the other direction. There are 19 castles on the Wall, though the most ever manned at one time by the Night's Watch was 17, with only three garrisoned by the time Jon Snow joined. The Night's Watch never allowed the forests beyond the Wall to come within more than half a mile of it, though with their numbers greatly decreased over time, the trees have encroached where empty castles stand. Atop the Wall are trebuchets, catapults, and cranes, and the Night's Watch can shoot arrows and drop barrels of ice on any invading force, all while remaining safely out of firing range themselves. Even the tunnels under the Wall can be flooded and frozen to keep attackers out (which is what was done with most of the tunnels of abandoned castles so the Night's Watch didn't have to worry about them). Wildlings have to climb over, or try getting by the naval patrols of Eastwatch, if they hope to pass it. Unless they try to attack a manned gate, like Mance Rayder did during the Battle of Castle Black. But mankind did not build the Wall alone. Legends say that Bran the Builder relied on the help of the Giants and the Children of the Forest. The Giants were said to lug huge blocks of ice during its construction, but the diminutive Children were a magical race with supernatural powers. Whatever magic they used in building it and helping it stand (it defies the laws of physics), their charms also kept the dead from passing through. Coldhands in the novels said that's why he could not go beyond it (as did Benjen Stark on the show). Whatever charms and spells the Children used to build the Wall are unknown. What is known, however, is how powerful their magic could be given how they used it when they fought the First Men. Outnumbered and desperate to save their weirwood trees—which they believed to be their gods and ancestors—from the axes of the First Men, the Children used dark magic to create two great floods, known as the hammer of the waters. The first was at the Arm of Dorne, the land bridge the First Men had used to cross over from Essos. Those lands are now the series of islands known as the Stepstones. The other was at the Neck, the southern point of the North where Moat Cailin stands. The legends say that the Children sacrificed 1,000 captives to bring a huge wall of water to the flood the Neck in an attempt to split Westeros into two. It didn't work—though Moat Cailin is still a nearly impassable choke point into the North—but the display might have been enough to make the First Men agree to the Pact. Could the Children have created another massive wall of water for Bran the Builder, which was frozen to form his Wall? Are there any Children left to repair it now? But of all the stories of the Wall and its magic, none are as tantalizing as the magical Horn of Joramun, also known as the Horn of Winter. Legend says that it can bring down the Wall with a single blow. But Joramun was the wildling King-beyond-the-Wall who united with the Stark King of Winterfell to defeat the Night King the first go-around. The Night King is the infamous Lord Commander (a rumored Brandon of House Stark) who laid with a White Walker woman (the Night Queen?) not long after the Wall was built, and the two ruled over darkness at the Nightfort for 13 years. If Joramun was a hero against the darkness, why would his horn bring down the Wall? Why would anyone want to destroy mankind's greatest barrier against the dead? Could Joramun have wanted to make sure his people weren't trapped by it if and when the White Walkers came again? Or is the Horn of Joramun a fail safe for the living, because there is something trapped inside of it that could be used as a weapon if mankind needed it, like they might now? There is a legend that says the Wall might contain an ice dragon in it, but those mythical beasts are probably nothing more than a ghost story. (Like the White Walkers were.) If they are real, maybe Bran locked it inside the Wall as a prisoner to protect mankind. Or just maybe Bran knew it might be needed some day, the way you fight fire with fire, maybe you fight the cold with cold. The Night King just used a dead dragon breathing a cold so powerful it took down part of a magical wall of ice. What could be strong enough to battle that? The answer might be an ice dragon that fights for the living. The Wall and its magic might have given way to the Night King and his dragon, but it might still have one final protection to help save the living. Or maybe it's something more metaphorical. Whatever the right question to ask may be, here's hoping an answer exists. Because if it doesn't, Qhorin Halfhand's warning to Jon Snow in the novels could come true: "If the Wall should ever fall, all the fires will go out." And when the fires go out, the ice comes in, but maybe that's why the living need an ice dragon now. What do you think? What gives the Wall its power? Can it hold long enough for the living to defeat the dead? Share your thoughts with us in the comments below. Conleth Hill insists that Varys is not a merman. Every question we need answered by the Game of Thrones finale. No, Jon Snow’s Longclaw did not blink!